The Welsh Bacc is a course that has been specifically designed in collaboration with employers, further education and higher education providers, to provide the learners with the skills they need in all areas of their future lives. Through the Welsh Baccalaureate learners will raise their skills levels and confidence, enabling and empowering them to take their place as responsible and active citizens within a diverse society. Alongside and through the development of skills, the Welsh Baccalaureate provides learners with the opportunity to develop their knowledge and understanding of society, the community in which they live and an awareness of global issues, events and perspectives. 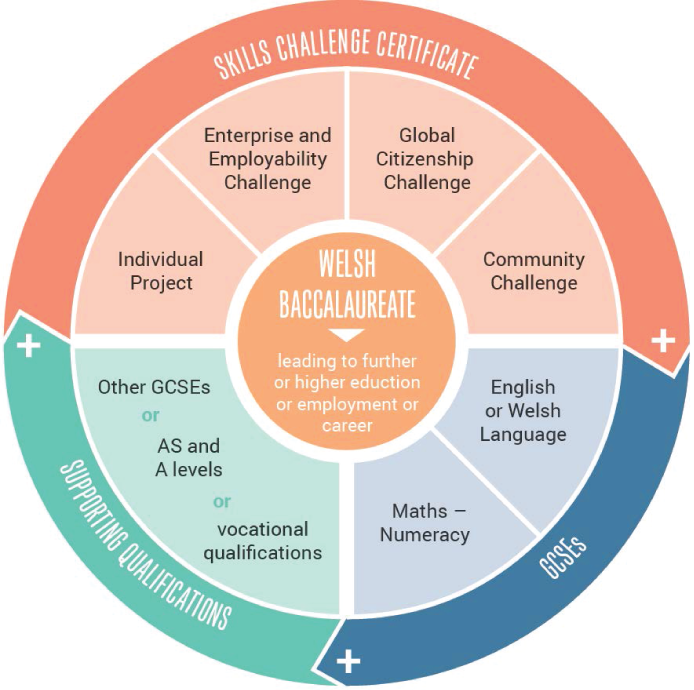 In order to achieve the Welsh Bacc the learners must complete the Skills Challenge Certificate as well as a range of supporting qualifications. Learners will complete the three challenges (Enterprise & Employability, Global and Community) during year 10 and the Individual Project in year 11. The pupils will be prepared for the challenges and project through a teaching and learning programme which targets the skills that the pupils need to demonstrate during their controlled assessment. The combined outcomes of the four components will determine whether the Skills Challenge Certificate is awarded at National or Foundation level. There are no examinations for the Welsh Baccalaureate Skills Challenge Certificate. Assessment is completely through controlled assessment, which will be undertaken throughout the whole of year 10 and 11. As a result of this, pupils who are absent from school are at risk of seriously reducing the marks they could achieve in the challenge they are undertaking at that time. The challenges and project are internally marked and externally moderated by WJEC. The Supporting Qualifications include two mandatory GCSEs of English Language or Welsh Language together with Mathematics-Numeracy or Mathematics. A further three GCSEs are also required, of which two may be of equivalent qualifications. To meet the National Welsh Baccalaureate requirements all five of the Supporting Qualifications must be achieved at grades A*-C. Similarly, for the Foundation Welsh Baccalaureate the Supporting Qualifications must be achieved at grades A*-G.